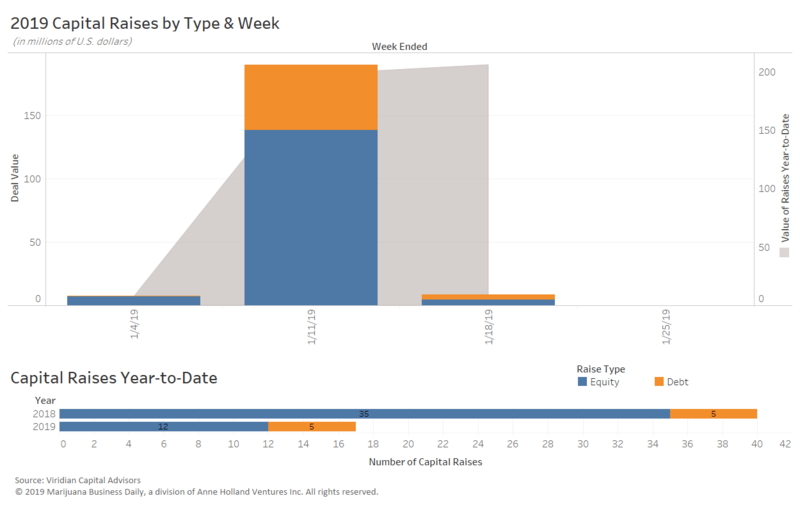 Only three weeks into January, observers who are closely following the money flowing into the cannabis space likely have noticed a big dip in the amount of capital raised so far this year compared to the same period in 2018. Through Jan. 18, 2019, $208 million has been raised by North American cannabis firms, according to data tracked by Viridian Capital Advisors. That’s down nearly 60% from the $499.4 million raised during the same time frame in 2018. What’s causing the capital infusion lull in what’s been touted as the fastest growing industry on the globe? A look back at the deals inked in early 2018 paints a clearer view. “The main factor in the year-over-year decline thus far has been a reduction in investment activity to Canadian (licensed producers),” noted Harrison Phillips, vice president at Viridian. Throughout the new year, Viridian expects cannabis firms to exceed the record $13.8 billion raised by firms in 2018, as more U.S. companies go public and companies raise capital to continue to scale. 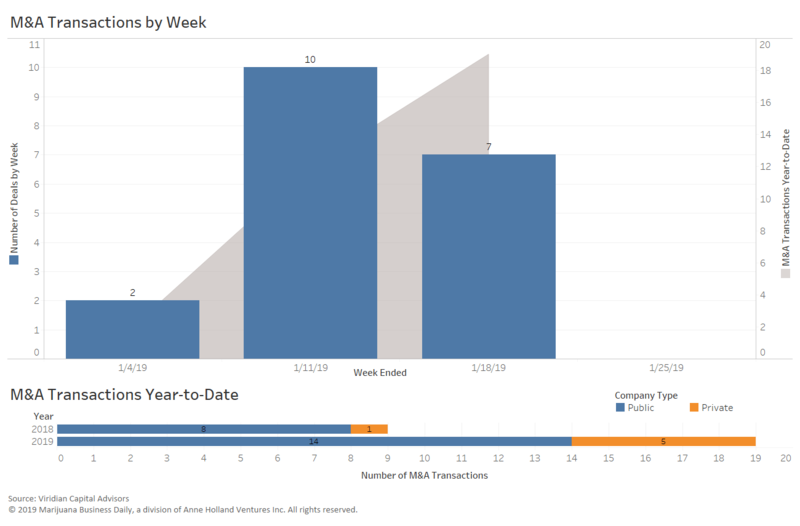 The data below, provided by Viridian, offers a recap and highlights of deals inked in the industry through the week ended Jan. 18. Cardiol Therapeutics closed on 1.7 million Canadian dollars ($1.3 million) through an exercise of underwriters’ over-allotment option of the firm’s recently completed initial public offering (IPO). That brings the total proceeds for the IPO to roughly CA$16.9 million. Cardiol, based in Ontario, is focused on cannabinoid technology, which has become a “significant area of interest due to apparent evidence of cannabinoids potential efficacy” for a variety of conditions, Phillips said. The company’s research targets heart failure and cancer. Compass Cannabis inked a CA$6.75 million raise, which the British Columbia-based company plans to use to expand its Starbuds-branded retail locations across Canada. The company is also planning for the opening of its first clinic in Sydney, Australia – underscoring the global momentum under way in cannabis as “Canadian firms continue to branch out internationally to capture demand,” Phillips said. TILT Holdings completed two multimillion-dollar acquisitions. The Massachusetts company – which specializes in cannabis technology, cultivation and support solutions – agreed to acquire Jupiter Research, a Phoenix-based vaporization technology business, for $210 million. TILT paid $70 million in cash and the rest in stock. The company also completed a $50 million acquisition of Nevada-based Blackbird Holdings – a deal that adds distribution, data and a delivery platform to TILT’s portfolio. Canada’s C21 Investments closed its $50 million acquisition of Silver State Relief, a leading operator in Nevada. “Interest in Nevada licensees remains strong due to developed adult-use market and relatively low license count,” Phillips said. British Columbia-based C21 trades on the Canadian Securities Exchange under the ticker symbol CXXI.